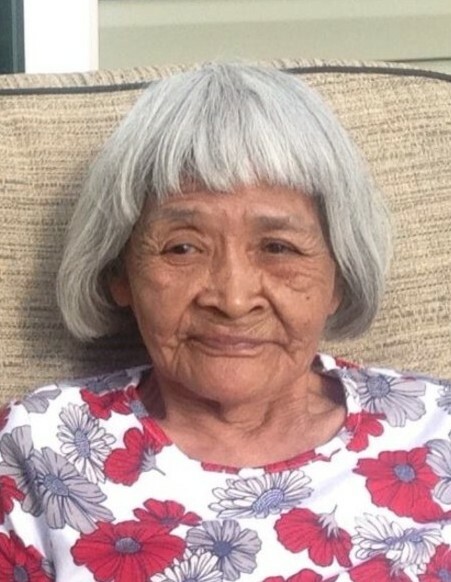 Irene Francis went to be with our Lord on Saturday, November 17, 2018 from the Caring Bridges Assisted Living home in Fairbanks, Alaska. Irene was born on April 21, 1944 to the late Elwood Sr. and Susie Hunnicutt in Kotzebue, Alaska. She spent her early years growing up in Kotzebue. She attended Friend’s Mission School for a year before moving to Fairbanks where she graduated from Lathrop High School in 1963. As a young, single mother of 2 babies, Irene went on to pursue a career as a nurse. She lived in Seattle, Washington; St. Paul, Minnesota; and Attleboro, Massachusetts before settling back in Kotzebue. She worked as a mid-wife at the old hospital in Kotzebue. It was during this time she met her future husband, Frank. He was in Kotzebue working on the water project for the City. Irene and Frank spent time in Kotzebue, Anchorage, and Fort Yukon. In Anchorage, Irene worked at the Alaska Native Medical Center in the surgical unit. They later moved to Arctic Village where they raised their youngest son, David, before finally settling in Fort Yukon, where they lived the rest of their lives. Before retiring, Irene worked as a health aide. Irene was known for being a hard worker and a wonderful cook and baker. She would go out of her way to help anyone. She would do anything she could for those that needed help. When her older brother Elwood Hunnicutt Jr. was sick, she came back to Kotzebue to help care for him until he passed. She loved to bake biscuits and rolls, especially for her tutiks (grandchildren). Irene was fiercely loyal to those she loved, sticking up for and defending those she thought were being treated unfairly. Irene had a great sense of humor. Her smile lit up a room and her laugh was contagious. Irene loved spending time with her family. She loved being at fish camp and following her husband out hunting. She had a great love for children and provided childcare for numerous children. Irene is survived by her children, Dennis Hunnicutt and wife Josie, Lulu Chamblee and husband Carl, David Francis and partner Twanda Strom, and John Curtis. Grandchildren, Amy Jo Arey and Andrew Booth, Sr, Erica Hunnicutt, Travis Hunnicutt, Joseph Arey, 2nd Lieutenant Justin and Darrian Chamblee, Anton Chamblee, and Carl Chamblee II. Great grandchildren Joshua Arey, Andrew Booth Jr. and Jordan Arey. Brothers, Roy Hunnicutt, Rodney Hunnicutt, and Penrod “Max” Hunnicutt, sister and brother in laws, Irma Hunnicutt, Maude Hunnicutt, Joseph Rudolph, Annie Christian, Mary and 2nd Chief Trimble Gilbert, Bella and Don Savino, and Millie and Zeno Podolski, and Irene is also beloved by her many nieces, nephews, cousins, relatives, and friends. Her life-long childhood friends were Aurora Madsen, Edith Swan, and *Diane Nelson. She was also close to Lena Hanna, Auggie Hoffman, Vivian Lane, and Evelyn Shy. Adopted and loved by Virginia Peter and June Talbott. Irene will be greatly missed by those who knew and loved her. Irene is preceded in death by her husband, Frank Peter Francis, parents, Elwood Sr. and Susie Hunnicutt, siblings; Elwood Hunnicutt, Jr, Myra and Nelson Walker, Sr., Willard Hunnicutt, Sr., Glenn Hunnicutt, Emma Hunnicutt, Hale Hunnicutt (2nd), Patsy Rudolph, Edith Brown, Hale Hunnicutt (1st), and Ruth Hunnicutt, and brother in law, Abraham Christian. Funeral Services and Celebration of Life will be held on Saturday, November 24, 2018 at 12:00 p.m. at Saint Stephen’s Episcopal Church, Fort Yukon, Alaska. Those serving as Pall Bearers include; Dennis Hunnicutt, David Francis, Carl Chamblee, Carl Chamblee II, Simon Thomas and Hans James. Honorary Pall Bearers include; Don Savino, Zeno Podolski, Travis Hunnicutt, Justin Chamblee, Anton Chamblee, Ron Hunnicutt, Mike Thomas, Andrew Firman, and Duane James.